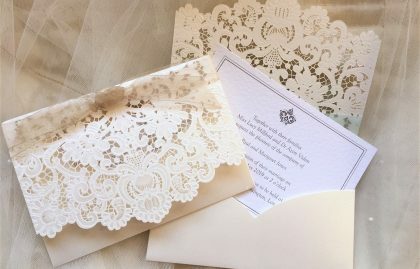 Laser Cut Wedding Invitations are produced courtesy of the latest precision laser cutting technology which transforms paper into delicate lace. 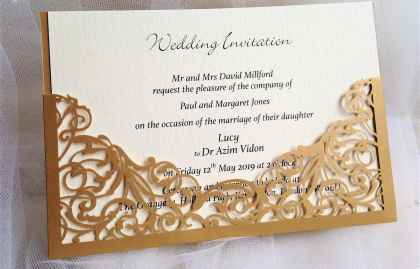 Announce your wedding in style with our beautiful intricate laser cut wedding invites. Intricate patterns that mirror a lace design add an understated glamour to your wedding. 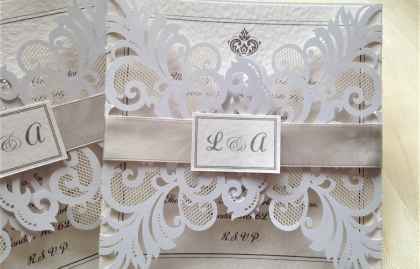 Perfect for couples looking to wow their guests with sophisticated elegant wedding invitations. We supply free envelopes and free guest name printing on all our invitations. We can print your invites in any font typeface of our choice. Design your invitation to suit the style of your day. The wedding invitation is printed on a thick heavy hammered card and is available in white or ivory. Some of our laser cut designs are also available with ribbon to match your colour scheme. We stock both satin and organza ribbon in over 40 colours. 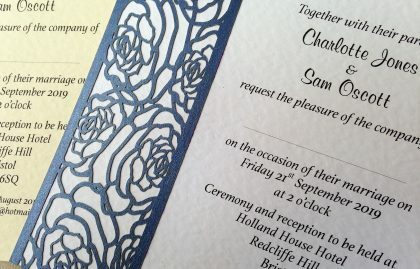 Daisy chain invites are suppliers of quality personalised wedding invitations and wedding stationery. Read our reviews and order with confidence. We are open 7 days a week until 9pm.